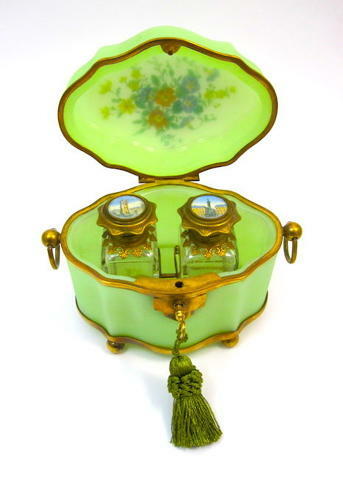 Large Antique Green Opaline Oval Perfume Casket with Double Loop Handles and Original Key. This Beautiful Perfume Casket Rests on Four Ball Feet and is Mounted in Fine Dore Bronze. It Contains Two Original Perfumes with Inside Stoppers and Each with Eglamise Miniatures of Paris. The Miniatures are Painted on Reverse Painting on Glass.